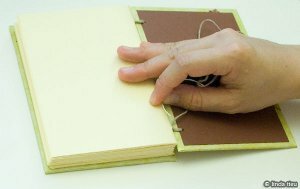 You'd never believe how easy it is to create and bind your own book. 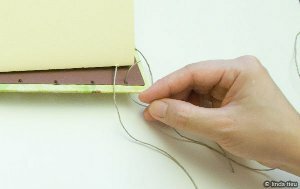 With this easy to follow Coptic Stitch Bookbinding Tutorial, binding your own book is easy and fun. 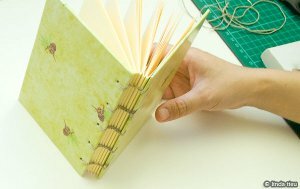 Create sketch books or journals for yourself or as gifts for your loved ones. Have a stack of short stories and poems? 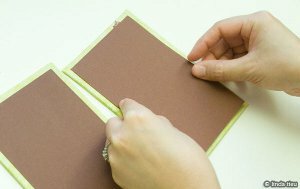 Bind them together and create a book you and your family can cherish for years to come. Paper signatures to go inside. Then I stuck them on the boards, cutting the corners at a diagonal so that it’ll fold over nicely without too much bulk on the corners. 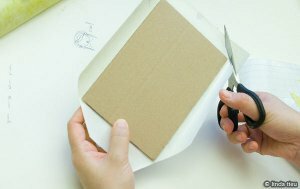 You just smooth down one corner and make sure everything is flat without bubbles and continuing securing the other sides. Then to cover up the empty side, I put in some dark brown liner paper…that will be the inside of my journal cover. Once my cover boards and paper signatures are ready, I start to punch my holes for the binding. You don’t really have to space them evenly, just make sure they are spread throughout the spine to be secure. I’ve marked up my holes on the cover then punched them out with a holepuncher. Then I use the cover as my guide to punch holes in all my signatures. It’s nice to use an awl just because the hole doesn’t need to be huge…it just needs to fit your string or thread type. 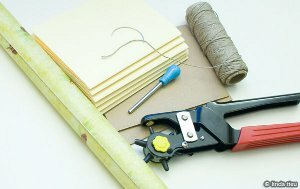 Once your materials are prepped, you are basically ready to sew. Pretty easy process at this point and not much different from other binding methods…it’s the stitching pattern that is special in this case. Note that you can have as many signatures you would like, however once it gets really fat, the sheer flexibility will allow your signatures to be more movable and not as “together” in my mind. They sort of “snake” around… but that’s just my experience. 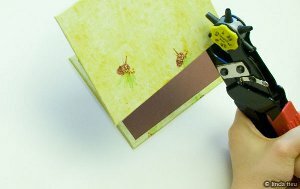 To start stitching, you go with one board and one signature inside. You can see I’m starting at the bottom hole inside the first signature. 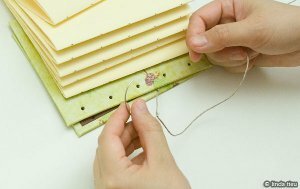 I like to wrap my thread around the cover board one more time, so it’s a double loop before putting my needle back into the signature bottom hole where I came from. I make sure everything is tight and aligned, then tie a knot. 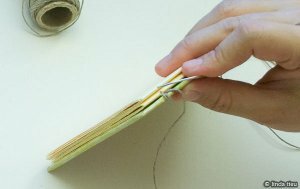 The important part of this method of binding is keeping the cover and signatures on top all aligned…because that’s exactly how it’s going to end up in the end. You want a perfectly aligned stack of signatures on the covers, nice and tight. From this point, I just move up one hole and repeat the process of looping around the cover and coming back up. 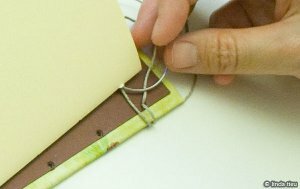 Only difference is that there is no knot to tie, you just keep looping through to attach the signature to the cover. When you get to the last hole, after looping onto the cover, instead of going back into the same signature you stack on another signature and go into that hole. See how I’ve come up from the top hole in my second signature here…then I immediately go to the next hole. …and on the outside I want to attach this signature to something, but there are no holes to go through like with the cover. Instead I loop my thread in between the signatures below it, in this case the first signature and cover. 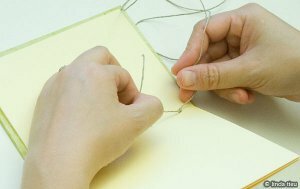 Just stick your needle into the left side of the stitch already there and exit to the right of it. 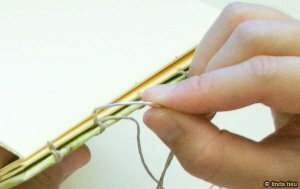 This is a kettle stitch that connects the stitches together and creates the cool pattern on the binding. 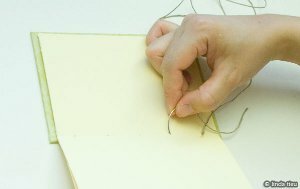 It is for this stitch that I use the curved needle, because it’s so much easier to stitch it in between the signatures. Here’s a close-up of the needle pulling the thread behind the existing stitch of previous signatures, from the left side to the right side. 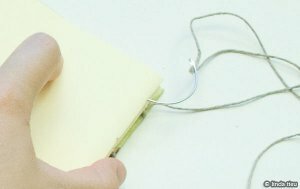 You are making a little loop to basically connect the new signature to the rest of the book. Once you’ve made this loop, the kettle stitch and tigtened it all, you stick the needle back into the hole you came from and repeat going down the line of holes. Again, once I get to the last hole of that signature, after doing the kettle stitch instead of going into the same signature again, I add a new signature and go into that hole. Repeat…repeat…repeat. Once you get the idea, you’ll be able to continue for as many signatures as you have, no problem! You’ll see here I’ve added all 5 of my signatures. There are ways of binding the last signature with the cover together…but I find it all confusing. So I bind all my signatures in the same fashion until there are none left. 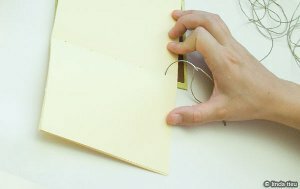 Then when I just have the cover left to bind, I sort of do the same thing, but weaving through the last signature again. This means the signature will have a double thread inside, but I don’t mind that for the easy of understanding the process. 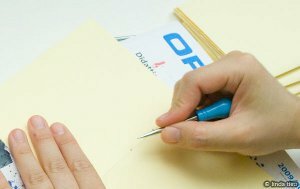 When I get to the last hole, instead of going back into the paper signature, I actually go in between the cover and paper signature. 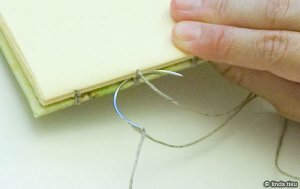 I loop it around that stitch and tie a knot here to finish binding the book. Pretty easy! One of these days I might learn another method, but this works really nicely for me anyway! 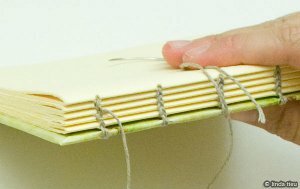 You’ll end up with a book that has a snazzy binding stitch showing, very neat and secure. 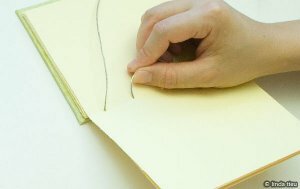 You’ll notice that the kettle stitches create a column of “v” or “u” looking pattern in the binding. The very left and right holes will look like half of that design, since it’s the edge. 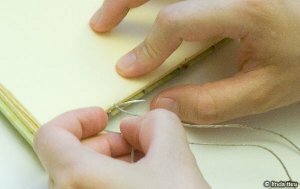 I attended a basic bookbinding workshop at school and loved it! It's so cool to find more I can learn. This tutorial is wonderful. I normally either buy my journals or make my own from notebooks. Then if I want something a little more personal I cover them with decorative paper I like or material. 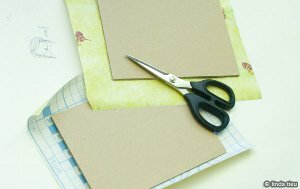 With this tutorial I will now try to make my own and if it is as easy as it seems, I might do one for my daughters birthday. I love the look of Coptic stitching! 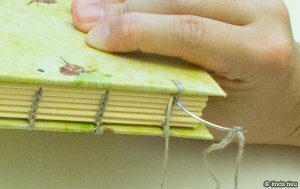 The exposed stitches on the binding are such a rustic look. I feel like it goes with the recycling aesthetic that is so trendy right now. Love it. 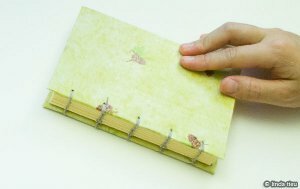 Love the idea of making my own journals! I go through something like a journal a month so I am always looking for more writing materials!! !